There were many reasons I moved to my new place in Richmond Hill. These included a place to call my own (along with a mortgage of my own), a wider space to design and expand into. After moving into my place for a lot of reasons I found yet another reason to find my place, the passing dogs! 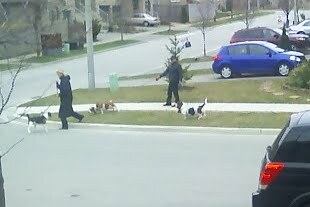 In my neighbourhood there are two basset hounds that go for a walk everyday with their owner. They love everyone and everything! I happened to have my cell phone (hence the grainyness) with me and took the following encounter happening across the street of one of the reasons to love where I live!